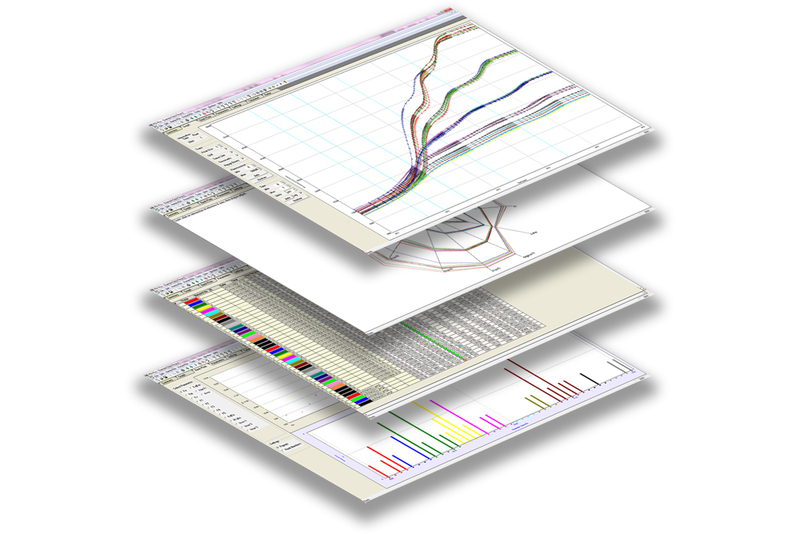 Powerful Windows® data transfer & analysis software included. Handy PEA+ consists of a compact, lightweight control unit encapsulating sophisticated electronics. 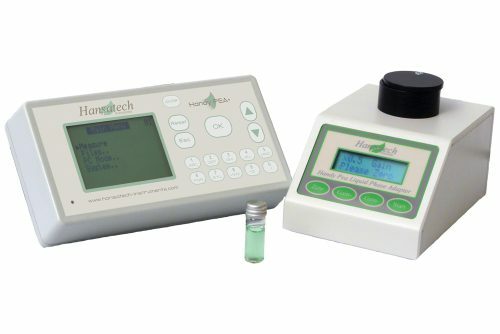 This provides the high-time resolution which is essential in performing measurements of fast chlorophyll fluorescence induction kinetics. Simple to configure and operate, basic measurement functionality can be defined directly on the Handy PEA+. More complex experimental design may be achieved using the Protocol Editor feature which allows up to 5 user-defined protocols to be stored in memory for different field applications. Protocols are written using a custom Windows® software package, PEA+ (supplied). A tactile keypad allows selections and inputs to be made and an LCD display module presents menu options and data. 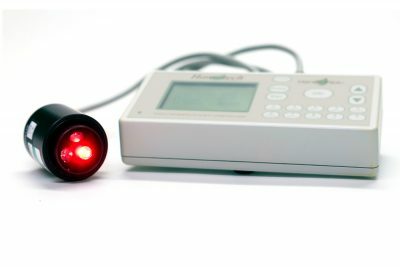 The sensor unit consists of an array of 3 ultra-bright red LEDs which are optically filtered to a peak wavelength of 650 nm (which is readily absorbed by chlorophyll) at a maximum intensity of up to 3,500 µmol m-2 s-1 at the sample surface. The LEDs are focused via lenses onto the leaf surface to provide uniform illumination over the area of leaf exposed by the leafclip (4mm dia). An optical feedback circuit monitors and corrects changes in the output intensity of the LEDs which can be caused by internal heat build-up within the LEDs themselves. The circuit also compensates for intensity changes caused by variation in ambient temperature. The sensor unit is fitted with a high-performance PIN photodiode. Optical design and filtering ensure that it responds maximally to the longer wavelength fluorescence signal and blocks the reflected shorter wavelength LED light used as the source of illumination. 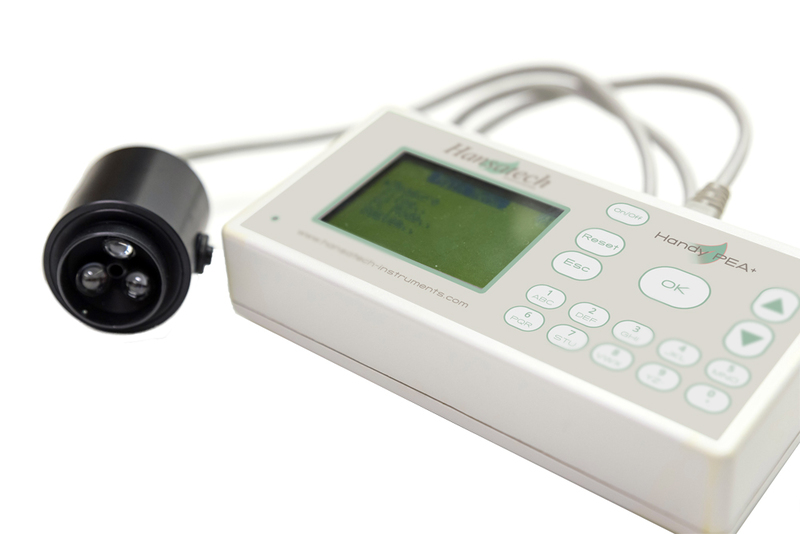 Variable-rate analysis allows fluorescence signals to be sampled at different acquisition rates throughout the different phases of the induction kinetic. Initially, data is sampled at 10 µsecond intervals for the first 300 µseconds with subsequent induction phases recorded at lower sample rates as the rate of kinetic activity reduces. Up to 1,000 recordings of between 0.1 seconds – 300 seconds may be saved in the onboard memory of the Handy PEA+. Calculated parameters may be viewed onscreen with more comprehensive data display achieved by transferring saved data via USB to a PC where the supplied PEA+ Windows® software allows a variety of numerical and graphical presentation options. 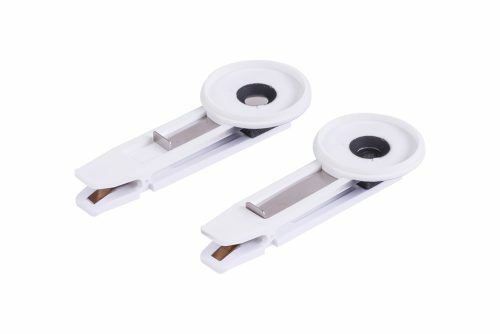 Continuous excitation fluorescence systems like Pocket PEA, Handy PEA+ and M-PEA rely on the use of a suitable leafclip system with 2 functions. Firstly, the leafclip shields the fluorescence detector from ambient light which would otherwise “blind” the sensor due to the comparatively high levels of red/infrared light within the same waveband as the fluorescence itself. Secondly, the leafclip pre-conditions or dark adapts a section of the sample prior to the measurement. Any measurement of the maximum photochemical efficiency of Photosystem II ( ) requires the sample to be fully dark adapted prior to measurement. During dark adaptation, all reaction centers within the sample are fully oxidised making them available for photochemistry and any latent chlorophyll fluorescence yield is quenched. This process takes a variable amount of time and depends upon plant species, light history prior to the dark transition and whether or not the plant is stressed. Typically, 15 – 20 minutes may be required to dark adapt effectively. Dark adaptation leafclips are constructed from plastic making them small and lightweight. 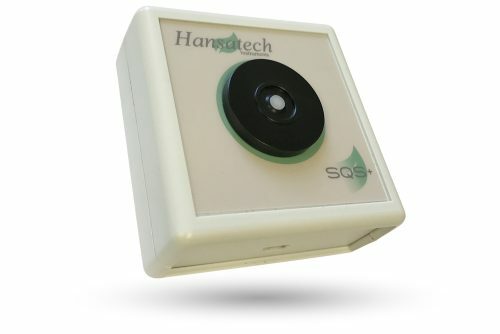 The locating ring (which interfaces with the fluorimeter sensor) is positioned over the required area of the sample and has a central 4mm diameter hole which is covered using a shutter-plate. During measurement, this shutter slides back to expose the dark adapted sample to the focused LEDs and fluorescence detector. 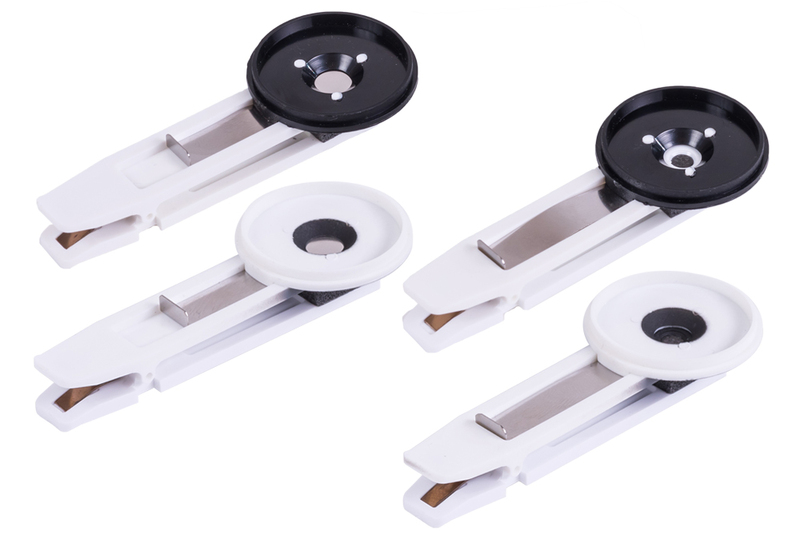 Pocket PEA leafclips have a black-coloured locating ring whereas Handy PEA+ and M-PEA leafclips have a white locating ring with a silvered underside which reflects incident light and minimises the build-up of heat on the sample. 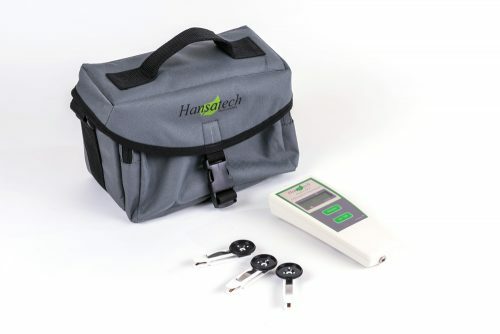 This ensures that the measurement is unaffected when measuring in high ambient light conditions. PEA+ is a multi-function Windows® program supplied with Pocket PEA and Handy PEA+ for system configuration, data acquisition and post-measurement analysis. 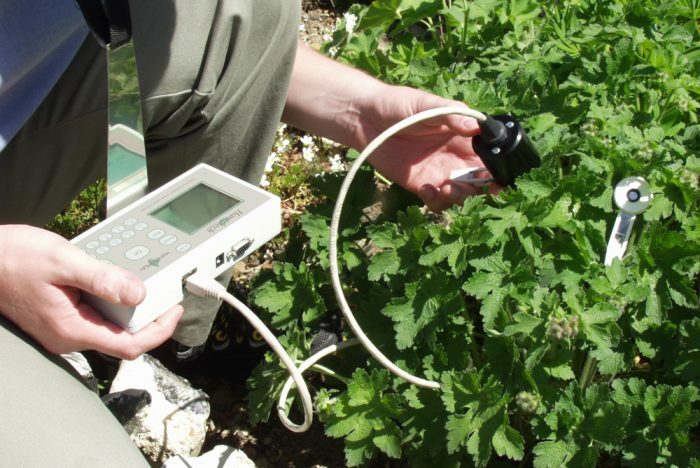 Several different data presentation techniques have been combined in order to effectively demonstrate subtle differences in the fluorescence signature of samples which could be indicative of stress factors affecting the photosynthetic efficiency of the plant. Data may be presented in graphical, tabulated or radial plots which can all be tailored to display any number of the 58 parameters measured by both Pocket PEA and Handy PEA+. Transferred data may be exported to CSV format for further statistical analysis in external software packages. PEA+ allows enhanced configuration of the Handy PEA+ via the Protocol Editor feature. 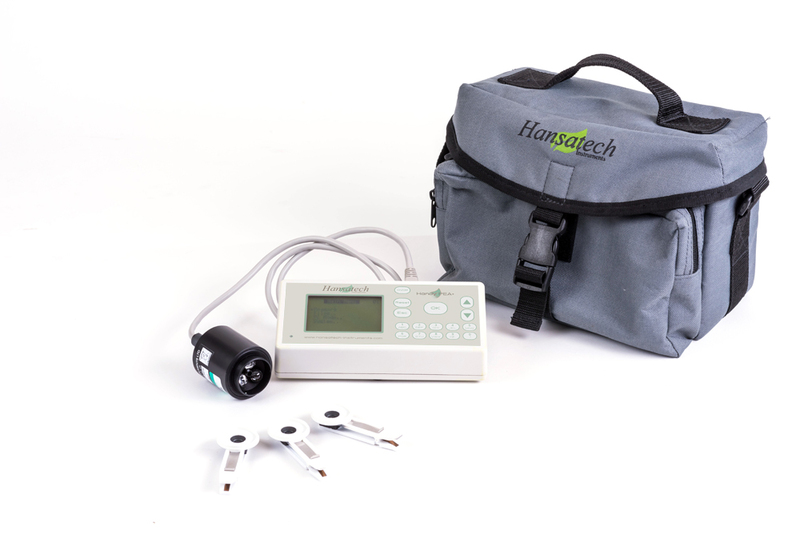 Protocols may be defined to include single or multiple-measurement assays with optional pre-illumination periods which can then be uploaded to the memory of Handy PEA+ via USB communications. The use of protocols ensures maximum reproducibility of results during field applications involving large-scale screening away from a laboratory environment. PEA+ will run on all supported Microsoft® operating systems. – Represents emission by excited chlorophyll a molecules in the antennae structure of Photosystem II. The true level is only observed when the first stable electron acceptor of Photosystem II called is fully oxidised. This requires thorough dark adaptation. – The maximum fluorescence value obtained for a continuous light intensity. This parameter may only be termed as maximal if the light intensity used is fully saturating and the electron acceptor is fully reduced. – Indicates the variable component of the recording and relates to the maximum capacity for photochemical quenching. Calculated by subtracting the value from the value ( ). – An indication of the maximum quantum efficiency of Photosystem II and widely considered to be a sensitive indicator of plant photosynthetic performance. Presented as a ratio between 0 and 1, healthy samples typically achieve a maximum value of approx. 0.85. Values lower than this will be observed if a sample has been exposed to some type of biotic or abiotic stress factor which has reduced the capacity for photochemical quenching within PSII. is presented as a ratio of variable fluorescence ( ) over the maximum fluorescence value ( ) and is calculated as . – Indicates the time at which the maximum fluorescence value ( ) was reached. May be used to indicate sample stress which causes the to be reached much earlier than expected. 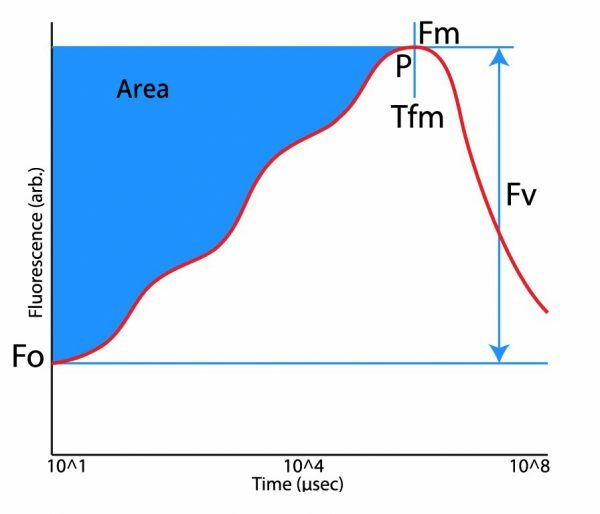 – The area above the fluorescence curve between and is proportional to the pool size of the electron acceptors on the reducing side of Photosystem II. If electron transfer from the reaction centers to the quinone pool is blocked (such as is the mode of action of the photosynthetically active herbicide DCMU), the area will be dramatically reduced. The concentration of active PSII reaction centers per excited cross section ( ) is also calculated. is a parameter of the test and it is related to the force generated by the RC concentration per antenna chlorophyll. A more detailed derivation and explanation is beyond the scope and intention of this web page. Further detailed information may be obtained from the following publications which may be downloaded as PDF documents from the following links. The fluorescence transient as a tool to characterize and screen photosynthetic samples. Strasser, R.J., M. Tsimilli-Michael and Srivastava, A. Analysis of the Fluorescence Transient. USB Drive containing PEA+ software and manuals. One of the extensions of the Google search facility is Google Scholar. It allows you to search through vast archives of peer-reviewed published papers and journals that have been posted online. Use the tool below to enter search terms as required. As an example, hansatech instruments Handy PEA+ has already been entered into the search box. Press the "Search" button to view the Google Scholar results for this search string. Admittedly, some of the results link to journals which require subscription in order to view the publications but even so, we have found this facility to be a valuable tool.